Due to popular demand, legendary English singer Phil Collins has announced an additional North American leg for his Still Not Dead Yet tour. The singer took to social media on Thursday, 21 March 2019, to announce the additional tour dates by posting a promotional image of his tour poster along with the dates of the upcoming shows. The leg, which commences on Friday, 23 August 2019 and runs through till Saturday, 19 October 2019, marks the singer’s musical return to North America in twelve years. The shows will follow Collin’s European stretch, where he will play a series of summer concerts all around Europe. According to Setlist.com, the singer is expected to play a total of twenty songs in his show, which includes the opening song Against All Odds and the closing song Sussudio. Take Me Home, which will be heard as the encore performance. Collins will perform a number of cover hits such as Throwing It All Away and Follow You Follow Me by Genesis, Separate Lives by Stephen Bishop, You Can’t Hurry Love by the Supremes and Easy Lover by Philip Bailey. The fifteen-city tour will take place all around North America in major cities such as Dallas, Houston, Tampa, Atlanta, Charlotte, Detroit, Pittsburgh, Buffalo, New York, Louisville, Omaha, Denver, Phoenix, San Francisco and Las Vegas. Tickets for the North American leg of his tour go on sale for verified fans on Friday, 29 March 2019 and general tickets on Saturday, 30 March 2019. 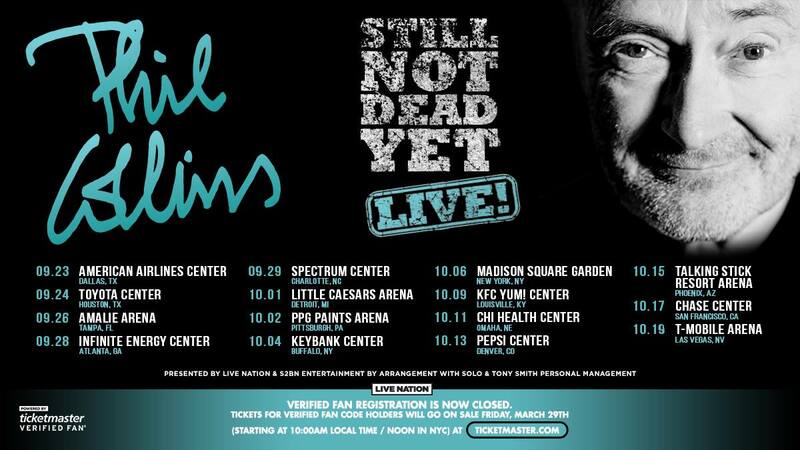 For more information on the Still Not Dead Yet tour, visit the official Phil Collins website.